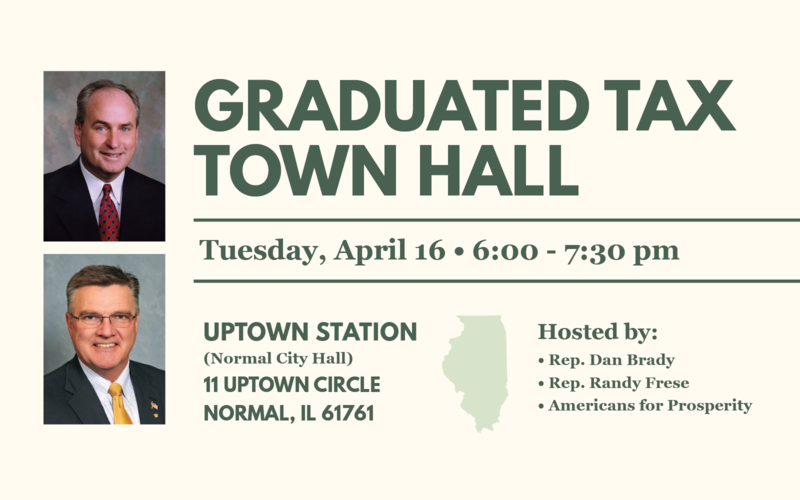 State Representative Dan Brady will host a Town Hall Meeting in Normal next week to discuss Governor Pritzker’s plan to implement a graduated income tax system in Illinois. “Now that the Governor’s plan has actually been introduced we can discuss the details and how they will impact families and businesses in our district,” Representative Brady said. The forum will include question and answer discussion and a presentation on the proposed income tax changes from Americans for Prosperity. Representative Randy Frese (R-Paloma) will also be joining the discussion. “This is one of Governor Pritzker’s top priorities, and he will be pushing for approval this spring. I hope everyone who wants to learn more about the proposed graduated tax will join us for the discussion Tuesday evening,” Representative Brady said.